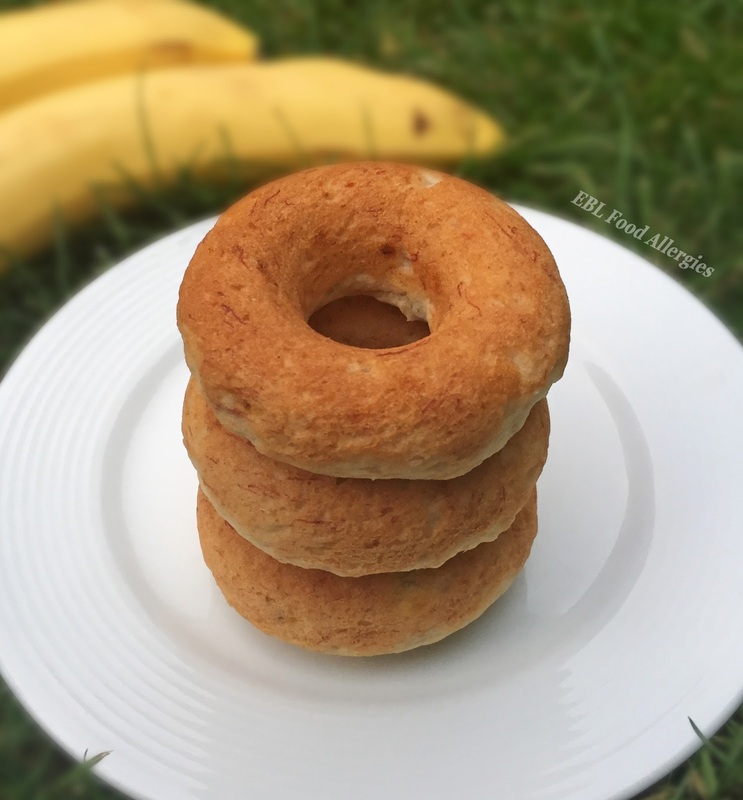 Try this delicious gluten free banana bread donut recipe which is also vegan and top8free (dairy-free, egg-free, soy-free, peanut-free, tree nut-free, wheat-free, fish-free, shellfish-free). Gluten-free donuts don’t need to taste like cardboard. Trust me! The best allergy-friendly donuts are less than 30 minutes away from coming out of your oven. My son has diet restrictions to dairy, egg, nuts, legumes, and garlic and I avoid gluten so it only made sense to make these donuts top8free so we could both enjoy them. Lucky for us they taste amazing so my husband and oldest son, who have no restrictions, also eat them. I made a large batch and froze the majority of them for later and kept out six for snacking and lunchboxes for the next couple of days. 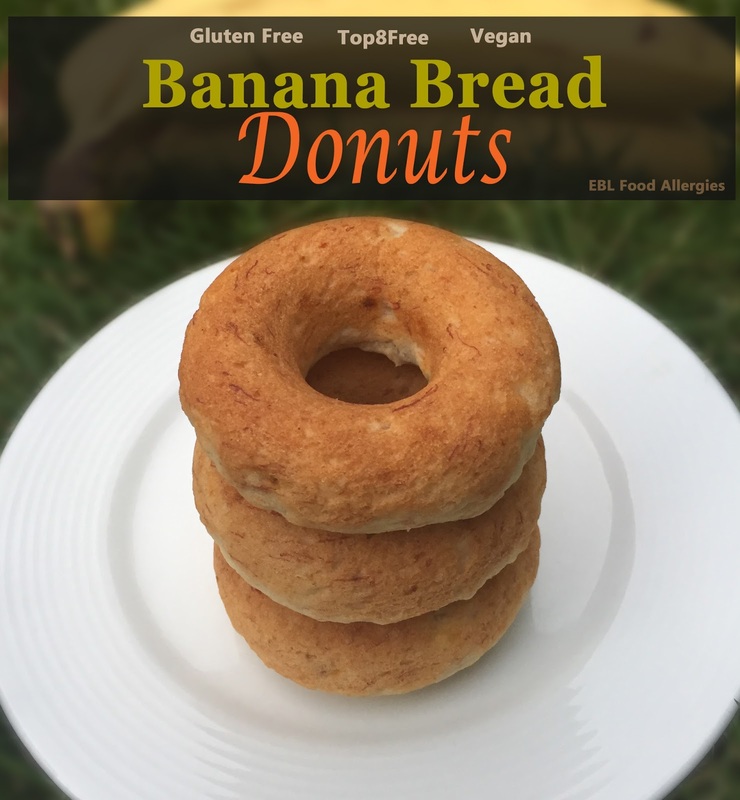 I used my original banana bread recipe (which contains wheat) and created a donut recipe which excludes wheat because let’s face it…kids love donuts even if they taste the same as muffins. There’s just something about the donut shape! In a large bowl mix first six ingredients with a fork until crumbly. Mix egg replacer and water in a small bowl. Add bananas and egg replacer to the large bowl and mix well. Pour mixture into gallon size bag and snip one corner to make a pastry bag. Pipe mixture into donut pan. Bake in oven 15-20 minutes, until inserted toothpick comes out clean. Cool for 10 minutes in pan then empty onto cooling rack and allow to cool completely. That’s it. Enjoy your donuts and make sure you save enough to put in the freezer! If you like this recipe you may also enjoy one of the many top8free recipes here. The baking blend you mentioned has baking soda and salt etc. Did you need the extra that you mentioned? This recipe is originally my husband’s grandmother’s recipe. When I made the substitutes to make it gluten free I still included the baking soda and salt. Thanks for the question! Hi! Two questions, can I use regular flour (do I need to add anything else)? And can I sub earth balance “butter” for the shortening (I don’t have any on hand)? Hello! Yes, you can use both regular flour and earth balance!